Migrating monarchs are fluttering daily into our yard in Vacaville, Calif., one by one, two by two, three by three, and four by four, for a little flight fuel. They're sipping nectar from the Mexican sunflower, Tithonia rotundifolia, and tropical milkweed, Asclepias curassavica. They're on their way to overwintering sites, such as the Natural Bridges State Park's Monarch Grove Butterfly Natural Preserve, Santa Cruz. 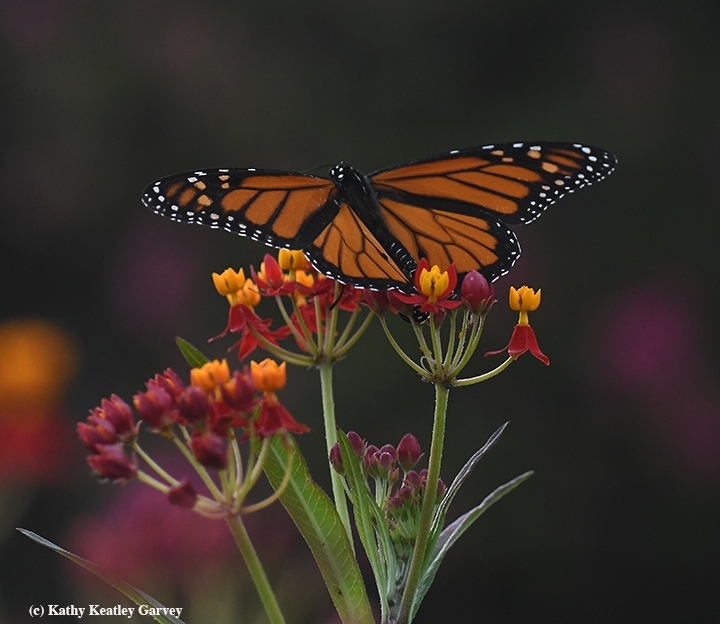 The park's monarch sanctuary "provides a temporary home for thousands of monarchs," according to the website. "In 2016, 8,000 monarch butterflies overwintered at Natural Bridges. 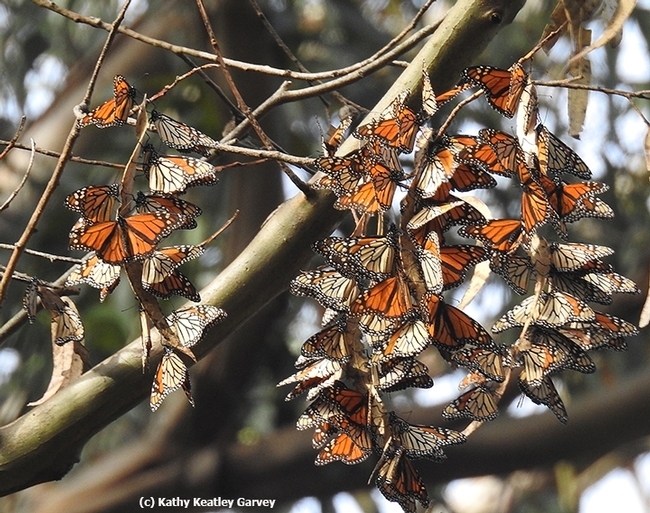 From late fall into winter, the monarchs form a 'city in the trees.' The area's mild seaside climate and eucalyptus grove provide a safe place for monarchs to roost until spring." The numbers typically peak between late October to mid-November. It's an awe-inspiring place, especially if you rear monarchs. And admission is free. The preserve is open to the public from 8 a.m. to sunset daily, or visitors can participate in a free one-hour tour on Saturdays and Sundays at 11 a.m. to 2 p.m. Meanwhile, scores of monarchs are on their way. Some won't make it. Predators, especially birds, will nail many of them. The weather will deter many others. We know of at least one that probably won't make it. On Friday, Oct. 27, while we were gathering mllkweed seeds from the Asclepias curassavica, we noticed two lady beetles feasting on aphids. Wait, what's that beneath that leaf? Could it be? It was. A monarch caterpillar! Talk about late! 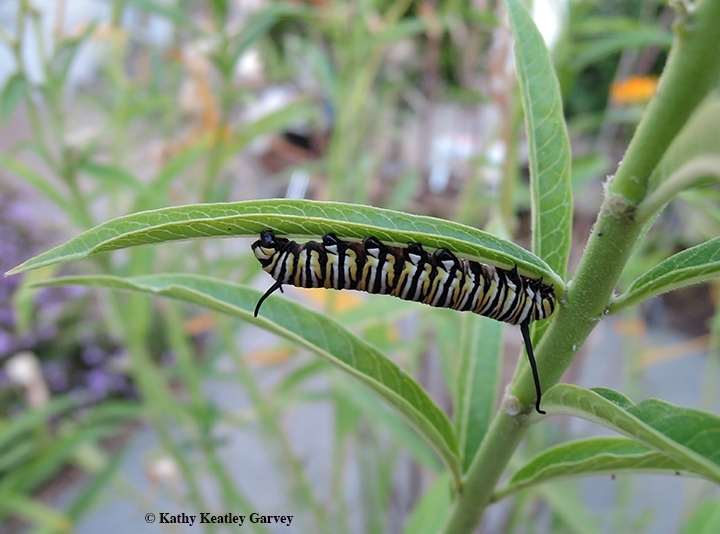 The 'cat is now tucked inside our indoor butterfly habitat, munching on milkweed leaves. With any luck, it will become a mid-life chrysalis and then an adult monarch. And if not a successful traveler, maybe fuel for a hungry bird?